2002 Lingerie Silkstone Barbie is known as the #5 Lingerie Fashion Model Silkstone Barbie. She is the first African American Silkstone. She is wearing a black merry widow bustier with a pink bow with a sheer matching robe. 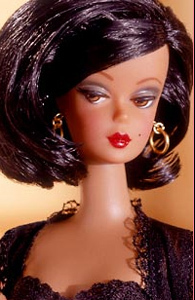 Like the other Lingerie Silkstone dolls, she has Golden hoop earrings that are so reminiscent of those worn by Barbie in 1959. She has thigh-high sheer black hose, secured by garters and black and high heel shoes. This Barbie was very popular when she was released and is one of the harder to find Lingerie Silkstone Barbie Dolls.